I was holding this post hoping to hear the fate of Hannibal first, but no such luck. The fate of the show is still a mystery. I really hope it gets renewed, as all other Bryan Fuller shows it is visually stunning and intriguing, so fingers crossed! I got most of it right except for Go On, which I was very inclined to believe would be renewed. I thought NBC was going to save at least one more comedy, but they decided to clean up the house instead. I am very excited about Community! The perpetual bubble show is, in my opinion, the best NBC comedy. I regret the loss of Deception because it was a good drama and I adore Victor Garber, however I knew the show was doomed even before it premiered. It came out at a weird time in the broadcast season and I don’t think they marketed it properly. Do I regret the loss of Smash? Yes… sort of. I liked Smash, yes, they had a lot of issues during the second season but still it had a lot of potential and an interesting concept. All the issues could have been fixed and the talent was there. Now, that was me being objective… the truth is that after voting for the E!online “Save One Show Poll” (which Smash won), I wasn’t so crazy about Smash. A lot of the comments from Smash fans rubbed me the wrong way, they were in the vein of: “Smash is the only TV show educated people watch and anybody who likes other shows is an ignorant”. It’s sad for the rest of the fans, I am sure a lot of Smash fans are lovely people, and hell I was a fan myself! But the end result was that I wasn’t too fond of Smash anymore. I confess, I actually celebrated the cancellation a little (or maybe a lot). Unfair? Probably, but it happened, which makes me sad because I am a TV lover, not a hater... Bottom line, be a nice fandom and respect other fandoms, that’s the way to get new viewers. For instance, I really want to check out Lost Girl because the fans in general seem to be so nice and classy across the web. NBC is also jumping on the JJ Abrams wagon and… I am not complaining. For me, there can never be too many JJ Abrams/Bad Robot shows on the air. So yes, I am excited for the new show Believe. What can make me even more excited than JJ Abrams? James Spader back on TV! His new show The Blacklist looks amazing. Unexpectedly I also liked the trailer for Dracula, it is a more traditional 'vampire' story, which is great because we don't need more teen vampires. As for the comedies I am rooting for Michael J.Fox because he is awesome. The trailer for the Michael J. Fox Show looked promising enough, so... let's hope it is good. 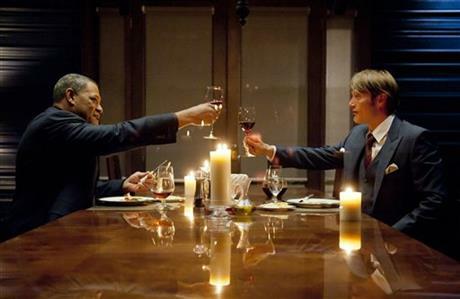 NBC FINALLY renewed Hannibal, which makes me so happy because 1) it is in line with my prediction and 2) It is an AWESOME show that I like more and more as I see more episodes.